Alabama is home to some of the greatest biological diversity in the United States, and many of its natural wonders can be found in the state’s numerous state parks. 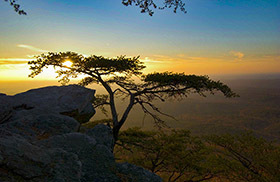 From the mountain forests of Cheaha State Park, to the subterranean darkness of Cathedral Caverns State Park, to the beaches of Gulf State Park, visitors can experience a remarkable variety of plant communities, wildlife habitats, and geologic formations and landforms. To promote the wealth of outdoor experiences to be had on Alabama’s public lands and celebrate the 75th anniversary of the state park system, the Alabama Tourism Department has declared 2014 "The Year of Alabama Parks."